This trim, neat building sits at a busy traffic junction on the Kirkley side of the Lothingland River, a short walk from the beautiful Lowestoft South Beach. The green copper spire and light brick gives it a slightly jaunty, Festival of Britain air, although it dates from almost a decade later, the foundation stone being laid in 1962. The main entrance is at the west end, a narrow galilee porch which runs the width of the building. You step through a screen into the central walkway. Again, the design speaks more of the decades before, and it is interesting to compare this simple, pleasant little building with the fabulous Lowestoft Trinity Methodist of less than ten years later. The east end is extremely effective, an austere tiled backdrop picking out a simple cross, with an even simpler little wooden holy table beneath. 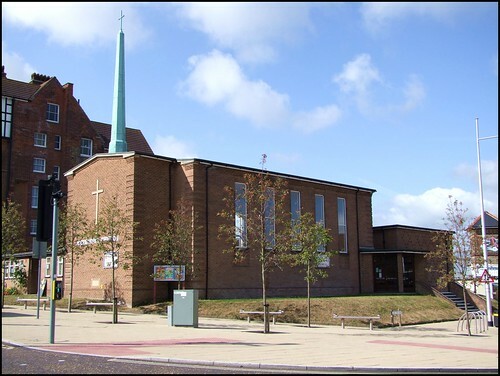 This church serves an area of Lowestoft which has undergone considerable improvement in the last few years, thanks to a massive injection of money from the European Social Fund. Lowestoft still has its traffic problems, as you can all too easily see at the junction outside, but this building is at once a focus and an adornment to this part of town, so close to Suffolk's very best beach of all.